It is well known that the performance of athletes who suddenly move to a location at a higher altitude than they are used to will suffer; when sports events such as the Olympics are held in a high altitude location, athletes often move to the area much earlier in order to adapt. The question I haven't been able to find an answer to is: How big of an altitude difference is significant? E.g. Will a sprinter who lives and trains at sea level feel any different competing at 200 - 300 m above sea level? 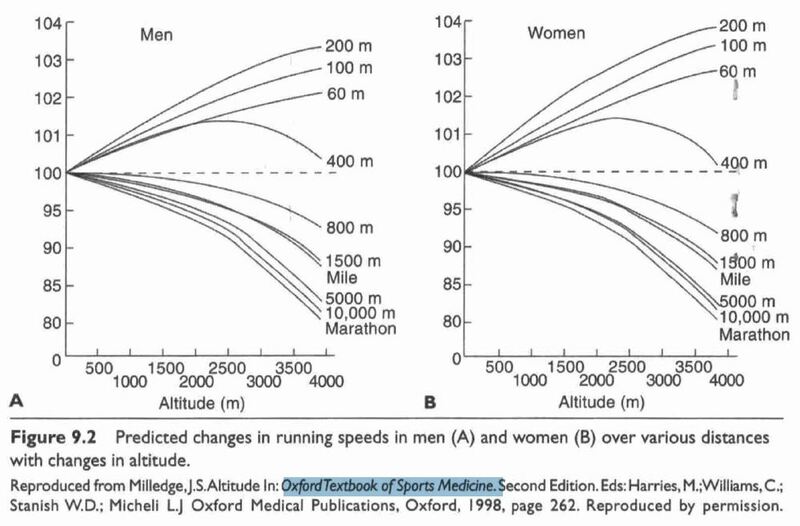 Performance in races of 60 to 200 m is always superior at altitude, with the benefit improving with increasing altitude. Performance in races of 400 m improve progressively up to altitudes of between 2000 and 2500 m but then begins to return to sea-level values. However, even at altitudes of 4000 m, performance is still slightly better than at sea level. Performance in races of 800 m or longer is always inferior at altitude; this deterioration in performance falls most steeply at altitudes above 2500 m.
(1) Tim Noakes (2001). Lore of Running. 4th ed. South Africa: Oxford University Press. 931. Not the answer you're looking for? Browse other questions tagged running training performance or ask your own question.